Tesla is reportedly planning a spartan interior for the Model S and X that’s similar to the Model 3, as seen here. One of the 2018 Tesla Model 3’s most distinctive features is its spartan interior, a virtually button-free environment with most controls confined in a horizontal touchscreen. Now, the automaker is planning to introduce a similar interior for its more expensive vehicles, the Model S and X, according to a new report from Electrek. Electrek says it obtained documents that show Tesla is planning an interior design refresh that would make it more uniform it with the minimalist look of the Model 3. And indeed, the renderings Electrek obtained show something very similar to the Model 3, including replacing the Model S and X’s massive vertical dash with a horizontal screen similar to what we’ve seen in the 3. A glimpse of Tesla’s new Roadster planned for 2020 also has a minimalist look inside. A Tesla spokesperson declined to comment. The new design isn’t expected to go into production until the third quarter of 2019, Electrek reported, and the revamped look would extend through “the life cycle of the current Model S and Model X programs until 2021.” Being that it’s still more than a year out from the reported launch date, Electrek notes, the design could wind up being changed. 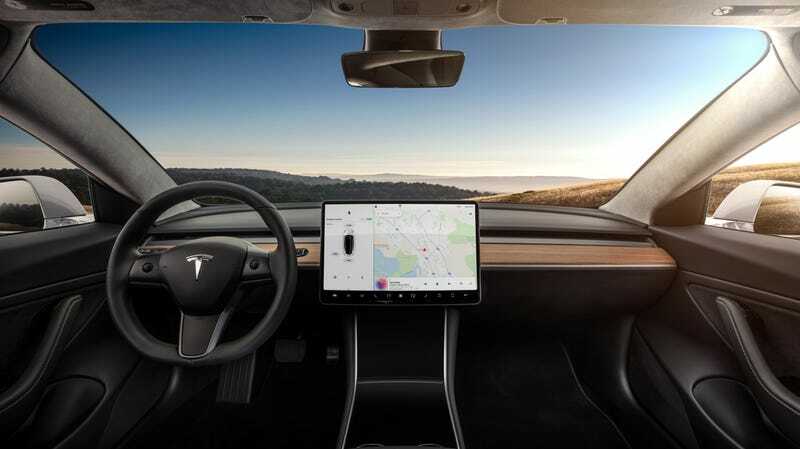 Based on what’s disclosed in the images, the new interior would bring the single-vent air conditioning of the Model 3 to the S and X, Electrek reports, but the cars would maintain a small instrument cluster, unlike the 3, which has virtually everything integrated into its center dash screen. All told, the similar look makes sense for Tesla from a cost perspective and to reduce the complexity of production across all three models.